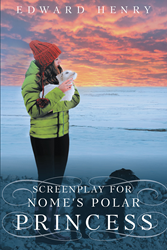 Recent release “Screenplay for Nome’s Polar Princess” from Page Publishing author Edward Henry is an adaptation of his prior work, “Nome’s Polar Princess,” for television or film. Edward Henry has completed his book “Screenplay for Nome’s Polar Princess”: an adaptation of a true love story between a California man on a fishing trip in northern Alaska and a passionate - and married - woman with bipolar disorder. This is a true story of how one man, on his journey to the Arctic Circle to satisfy his bucket list, finds love in Nome, Alaska. Edward, an electrician and California native, travels to Nome armed with his fishing gear and his guns for hunting. In short order, he sets both aside after meeting Nora, an educator in the area and in the villages. She is a redhead that tries desperately to hide her voluptuousness. Nora, a transplant from the Midwest, was hired to help the native youth to acclimate to city life. The native people are generous and accepting of Edward, who is a kind and generous man to the native people and to Nora. Edward has never experienced anyone like Nora. As their sexual experiences blossom and their relationship deepens, there is only one problem—Nora is married, and her husband, Park, is not happy about it. As the story unfolds, Park finds out about Edward, and he’s ready to kill him; but Park lives in the Midwest, far from Nome, so for the time being, Edward is safe. At this point, Nora wants to marry both men, which is shocking to Edward and maddening to Park. Nora struggles with bipolar disorder, which causes friction between the couple and confusion for Edward, who has never experienced this before. This is a journey of love and lust in the heart of a cold, desolate, sometimes very lonely, and unforgiving place. This journey is one that Edward could never have imagined and wouldn’t change for the world. The names of the individuals and animals in this story have been changed to protect their identities. The story includes explicit sexual language, adult content, and erotica. Published by New York City-based Page Publishing, Edward Henry’s book is an unforgettable story of passion and love above the Arctic Circle. Readers who wish to experience this riveting work can purchase “Screenplay for Nome’s Polar Princess” at bookstores everywhere, or online at the Apple iTunes store, Amazon, Google Play, or Barnes and Noble.